In each new ESXi release, VMware updates the VM version and, consequently, the parameters of virtual hardware. As a rule, in the new VM version new features appear, old bugs are fixed, etc. So when moving to a newer ESXi version it is recommended to upgrade virtual hardware version for all virtual machines. 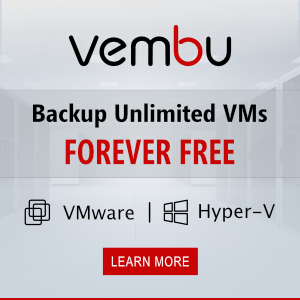 It’s better to use older VM versions only for compatibility purposes. 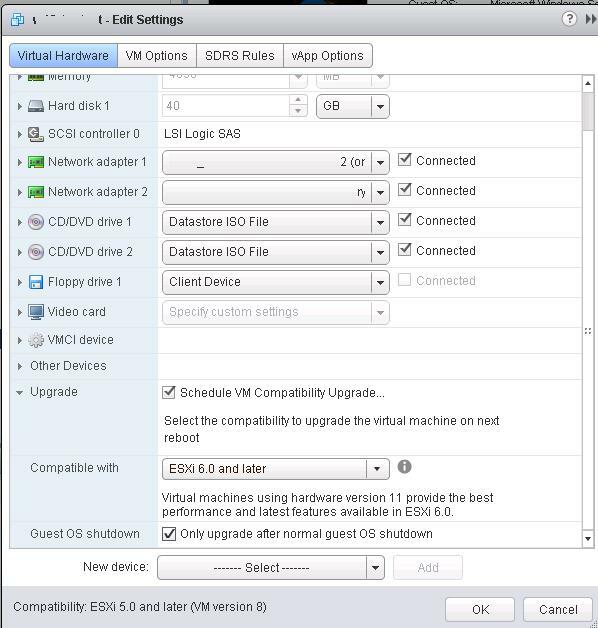 In this article, we’ll consider how to upgrade virtual hardware version of a VM running on a VMWare ESXi host. The compatibility of ESXi and VM versions is shown in the table below. You can see the current virtual machine (virtual hardware) version in the Summary tab of the virtual machine. 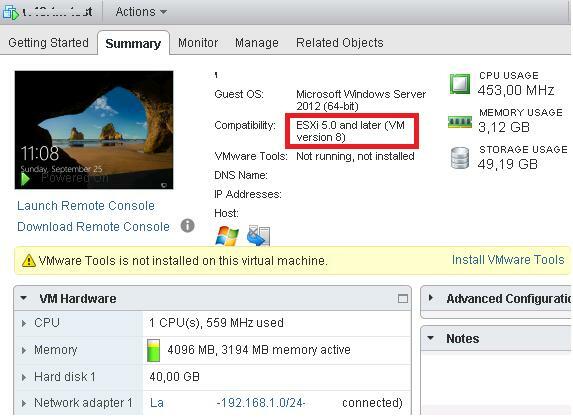 The screenshot below shows that VM version 8 (ESXI 5.0 and later) is being used. To upgrade the Virtual Hardware version, the virtual machine has to be stopped. After that right-click the VM to access Upgrade Virtual Hardware (Compatibility > Upgrade VM Compatibility in vSphere Web Client). You have restricted editing capabilities on a virtual machine of version 9 or higher using this client. Some devices may not appear in the devices list, and the settings of some devices may appear as “Restricted”. You can schedule an automatic upgrade of VM version after the next correct VM restart. 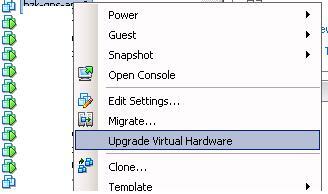 To do it, go to VM settings, switch to the Virtual Hardware tab and expand Upgrade. Check Schedule VM Compatibility Upgrade option and select the upgrade version. It’s better to check Only upgrade after normal guest OS shutdown option. Start VM and make sure that it has been upgraded to VM version 11.